This gets a lot of use in my kitchen. 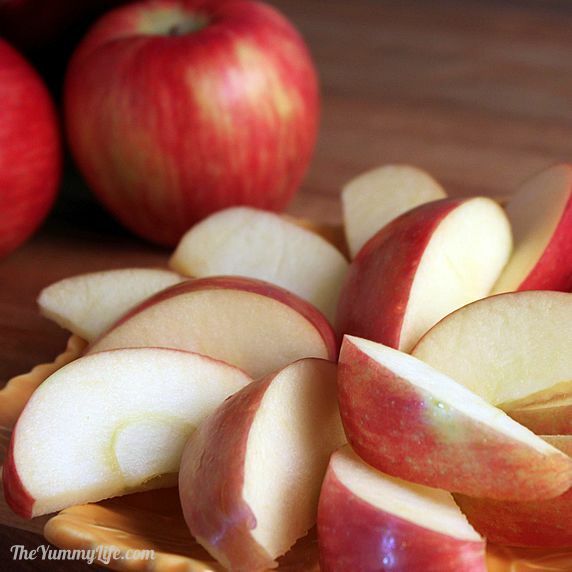 In one motion, it cuts 8 perfect apple slices. These bigger slices hold up better with thicker dips like peanut butter. Works great for slicing caramel apples, too! This cuts 16 slices from one apple. They're thinner and great for easy snacking, lighter dipping, and party platters. 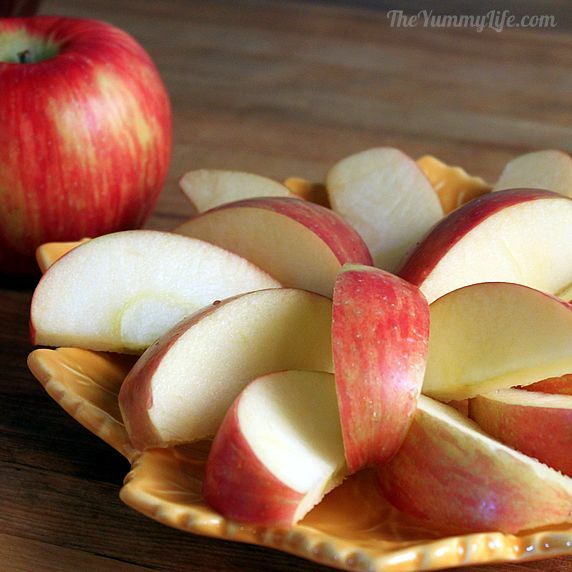 Soak apple slices for 5 minutes in a mixture of 1 teaspoon Fruit-Fresh per cup of water. Calling all kitchen nerds! In addition to being packed with great recipes, this cookbook explains the science behind all kinds of cooking methods--what works, what doesn't, and why. It's by the folks at Cooks Illustrated, and they know their stuff. Keep pre-sliced fruit in the fridge for healthy snacking! 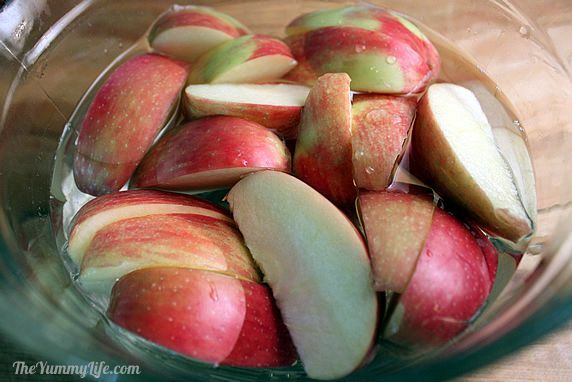 Use this simple soak method to keep pre-sliced apples and pears in the fridge without browning. Here's how to keep apple and pear slices from browning. Soak them in one of these solutions for 5 minutes. 1. Soak them in a bowl of cold salt water. Not too much salt, or it affects the taste of the fruit. Dissolve 1/2 teaspoon of salt per 1 cup of water. The soaked apples will have a slightly salty flavor, but you can remedy that by giving them a quick rinse before eating them. 2. Soak them in a bowl of honey water. Use 2 tablespoons of honey per 1 cup of water. 3. Soak them in a bowl of cold lemon water. This is better than squeezing the lemon juice directly on the fruit, unless you don't mind the fruit tasting really lemony. Mix 1 tablespoon of lemon juice per 1 cup of water. 5. Soak them in a bowl with Fruit-Fresh (or citric acid powder) and cold water. Fruit Fresh is sold in stores with canning supplies. Use 1 teaspoon Fruit Fresh per 1 cup of water. 6. Soak them in a bowl of apple cider and lemon juice.The apple cider enhances the apple flavor while balancing/diluting the lemon juice. Use 1/2 cup apple cider per 1/4 cup lemon juice. 7. Soak them in pineapple juice or a combo of pineapple and lemon juice; use tablespoon lemon juice per cup of pineapple juice. 8. Soak them in plain carbonated water. 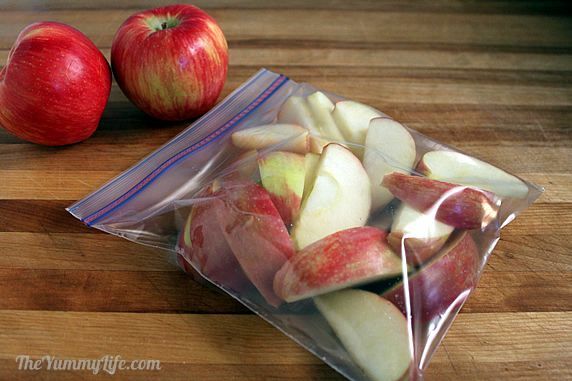 TO STORE THE SLICES: Store the fruit slices in a ziploc bag. After soaking the fruit slices, drain off the liquid and store them in a Ziploc bag in the fridge. Squeeze as much air out of the bag as possible before sealing it. Apples & pear slices stay fresh and and crispy this way. Their storage life can vary depending on the type and freshness of the fruit. If you're using fruit that is in season and fairly freshly picked, it will stay fresh longer than those that have been picked and stored for a long time. 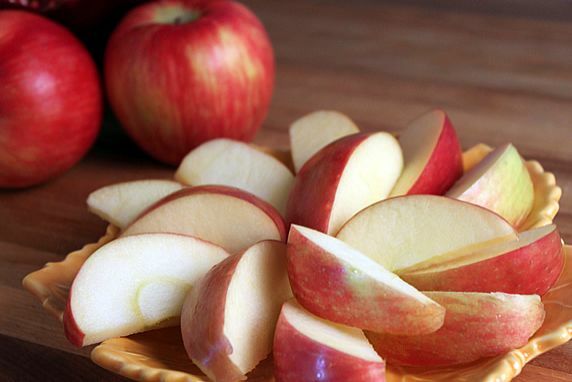 When using freshly picked apples, the slices may be stored for up to a week in the fridge. I try very hard to reach for fresh fruit for snacking and avoid the temptation of those chips and cookies that shout out my name when I walk by them. For me, I'm much more likely to grab a healthy snack if it's ready-to-eat. Apples are one of those things that I like to have sliced and in the fridge--especially now when they're in season. I eat them plain or sprinkle them with cinnamon. When I need a little protein boost, I dip them in peanut, almond, or walnut butter. The fastest, easiest way to slice an apple. I use an apple slicer to core and cut an entire apple into slices in one stroke--a great, inexpensive gadget that is available in many stores. 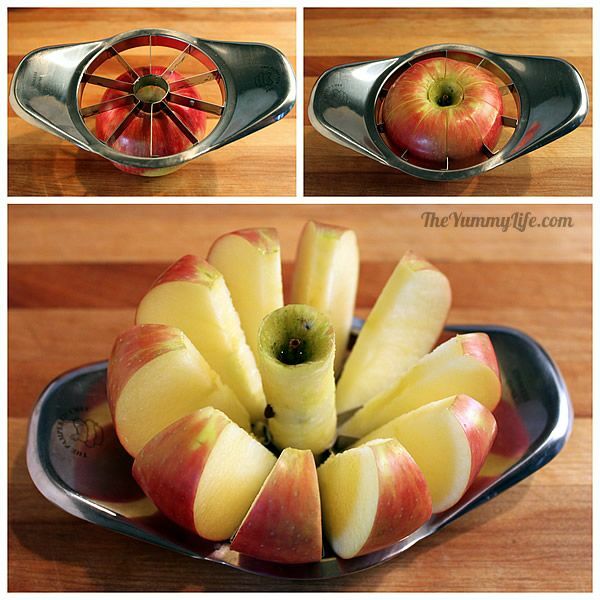 8-slice apple corer/slicer -- These bigger slices hold up better with thicker dips like peanut butter. Works great for no-mess slicing of caramel apples, too! 16-slice apple corer/slicer -- These thinner slices and great for easy snacking, lighter dipping, and party platters. Trouble is, apples (and pears) oxidize and turn brown quickly after they're sliced and exposed to air. Even though they still taste good, they're just not very appealing that way. So, I've experimented with some ways to keep them from browning, and there are a number of effective methods. How to keep apple and pear slices from browning. Soak them in one of these solutions for 5 minutes. Citric acid is the key ingredient in several of these, because it helps prevent oxidization (browning). My personal favorites are the salt water and honey water soaks--I've gotten consistently good results from both. Store the fruit slices in a ziploc bag. After soaking my fruit slices, I drain off the liquid and store them in a ziploc bag in the fridge. Squeeze as much air out of the bag as possible before sealing it. Amazing how long the apples stay fresh and and crispy this way. Their storage life can vary depending on the type and freshness of the apples. If you're using apples that are in season and fairly freshly picked, they will stay fresh longer than those that have been picked and stored for a long time. I've had them keep for up to a week. Slice fruit in advance for entertaining. You know what they say about "An Apple A Day . . . ." Having these nutritious fruit slices on hand may help keep the doctor away. Three Easy Dips--Pumpkin Pie, Caramel, and Peanut Butter. This post was updated 5/2015.